Baby Corn and Paneer Jalfrazie Lifestyle Fundas : Career and Education | Fashion and Life Style | Latest Trends | Travel Guide | Love and Relationships | Latest Technology | Health Care | Beauty TipsLifestyle Fundas..
Baby corn cooked up in the traditional jalfrazie gravy of capsicum and onions.This is very simple and choice for anyone.Specially for those who always love to eat panner. With Baby corn the taste is really awesome just mouth watering. 1. First of all heat the oil in a kadhai, add the spring onion whites on a medium flame for 1 minute. 2. Add the green, red and yellow capsicum on a medium flame for 2 to 3 minutes, till the capsicum turn a little soft.You can chceck and fel the color change of Capsicum and onion. 3. 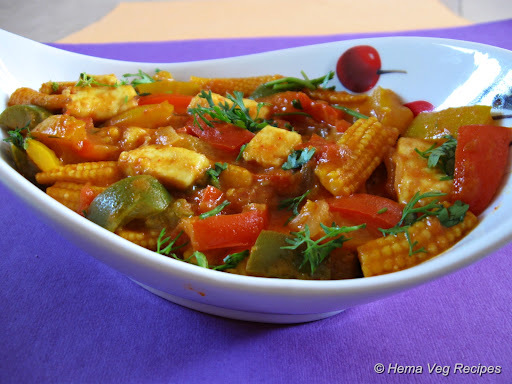 Add the baby corn, turmeric powder, chilli powder, coriander-cumin seed powder, tomatoes, tomato ketchup, tomato purée, mix well and sauté on a medium flame for 1 to 2 minutes, while stirring occasionally.Mix all the Ingredients well. 4. After That add the paneer, garam masala, vinegar, sugar and salt, mix well and cook on a medium flame for 1 minute. 5. Add the spring onion greens and a little water, mix well and cook on a medium flame for 1 more minute. 6. Its time to makeover your dish,so Serve immediately garnished with spring onion greens.